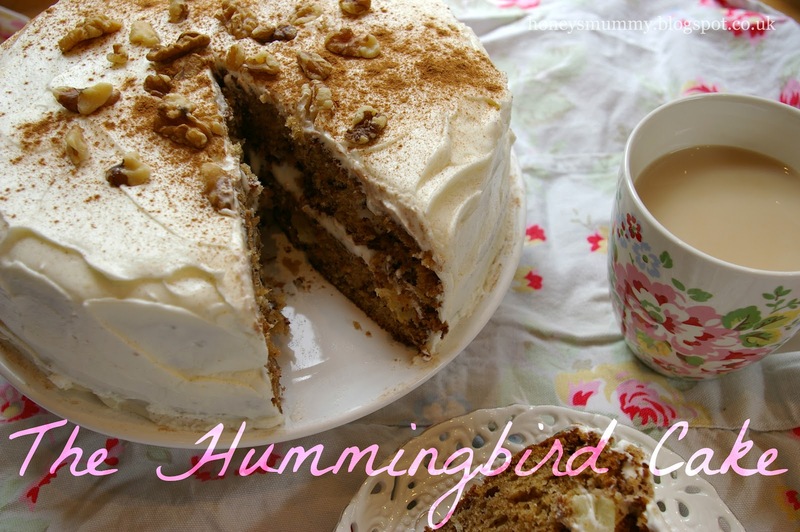 The Hummingbird cake from, you guessed it, the Hummingbird bakery cookbook, is a seriously yummy cake. 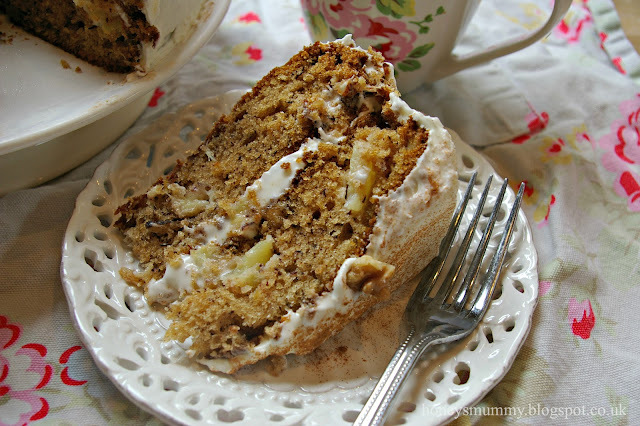 Like the love child of a banana and carrot cake all rolled into one it is very sweet and very naughty. If you can't decided which to make, this is the perfect combo. Super easy too. It is meant to be made in three layers, and I'm sure it'd look far more spectacular if it was, but I could only fish out two round tins so had to make do. Put the sugar, eggs, oil, banana and cinnamon in a free standing mixer with paddle attachment and beat until it is all incorporated. Slowly add the flour, bicarb, salt and vanilla extract and continue to beat until it is all well mixed. Stir in the pineapple and nuts by hand. Pour evenly into three lined 20cm round cake tins then bake in a preheated oven of 170C for 20 - 25 mins (or longer if using two tins) until it is golden brown and bounces back when touched. Leave to cool slightly in the tin before turning out onto a wire rack to cool completely. For the icing beat the icing sugar and butter together until throughly mixed before adding the cream cheese. Turn the mixer up to high and beat for at least 5 minutes to create a light and fluffy icing. When the cakes are cold layer up with the icing, remembering to leave enough to cover the sides. Decorate with a light sprinkling of cinnamon and any left over nuts. Enjoy served with oceans of tea.